School is back in session all over the Atlanta-area and I think the oh-crap-we-can't-eat-pizza-every-night-by-the-pool blues are starting to kick in for a lot of my fellow mamas. Back to school means more structure in our days, earlier bedtimes and oh yeah, a need for a dinner that my kids might eat to be ready before 8pm each night. Making dinner every single night is hard for anyone. But it's especially hard when you're pretty sure at least 50% of the diners at your establishment are going to throw and/or ignore the food you put in front of them. It's enough to make me want to serve mac and cheese every night. At least then we avoid the game where I serve a tiny portion of food to my kids, they pick at it until finally succumbing to our pleas to "just taste it." Then they spit the taste back out and render the entire plate of food worthless. So fun. Any dinners that have a greater than 50% chance of getting eaten (that means one kid likes it in this family) become Master Meals around here quickly. This recipe gets eaten in it's adult form by two children and if I take an extra step* cooking it, my other two will eat a bit of it as well. 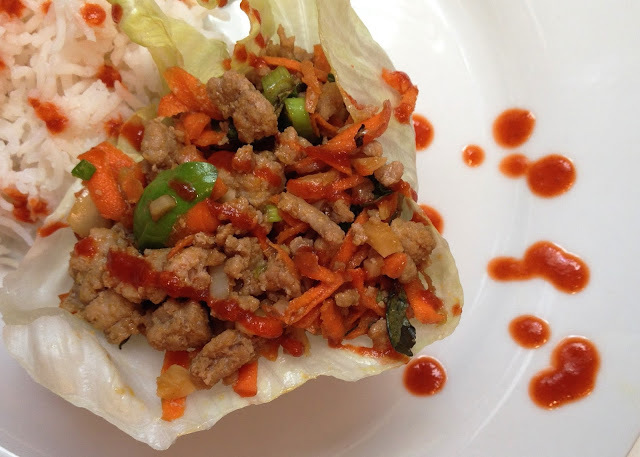 It uses ground turkey and a load of veggies so it's healthy and low calorie and it feels different because we eat it out of lettuce wraps. Oh and it's ready in under 20 minutes! If you're curious about our other go-to recipes, search "Master Meals" on the blog or read this post about how I plan family dinners. Serve with wedges of lettuce to scoop the turkey mixture into. We like ours with a drizzle of sriracha on top. Unless you're cutting out all carbs, make some brown rice (because you're healthy like that) to serve alongside. *To appease my picky eaters who would not touch something with several types of veggie mixed in, I scoop out a portion for each of them prior to adding the veggies, then grate some raw carrot onto their plates to make myself feel better.